The first church on this site was opened in September 1934. 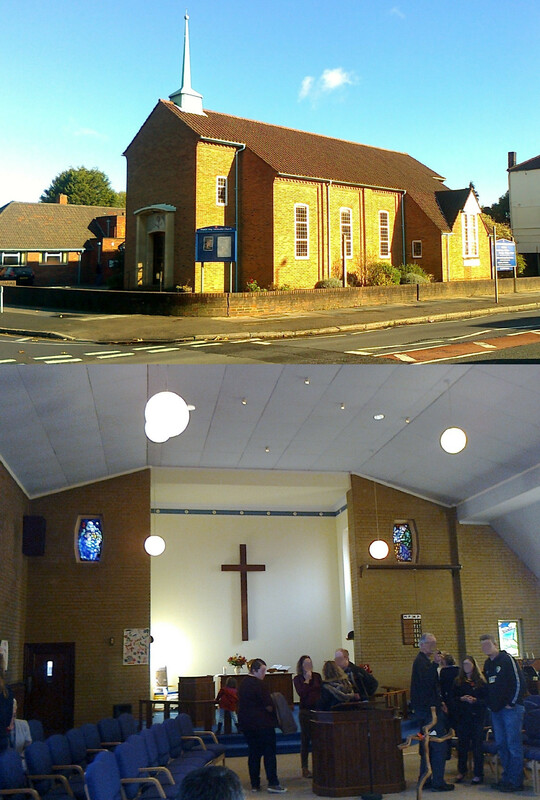 The current building was opened in May 1958, with the original building being turned into what is now the church hall. The building has a modern feel to it, built of warm yellow brick and with padded chairs instead of pews. The chairs are laid out along the sides of the church facing towards the middle of the nave, giving a rather open feel. A table with flowers, a candle, an open Bible and a metal plate for the collection is situated on the blue-carpeted sanctuary, with a lectern to the left of the table, a small wooden font to the right, and a chair in the back-left corner of the sanctuary. Behind the table in the sanctuary is a large wooden cross on the wall, and in front of the sanctuary is a large lectern with a microphone. A cross made of two pieces of twisted wood stood in front of this larger lectern, although that may only have been there for the service I attended. Most of the windows are plain, although the smaller ones at the front of the church have stained glass. Decorative organ pipes are above the doors at the back of the church, and a few posters made by children are up on the walls. The service was led by a male minister. Although he had a clerical collar, he was hardly wearing vestments of any kind but rather a leather jacket! This certainly helped to add to the open and modern atmosphere in the church. Some members of the congregation went up during the service to give the Bible readings and lead the prayers of intercession. I visited the church on Remembrance Sunday – this coincided with a church parade by about twenty of the Rainbows, Brownies and Girl Guides affiliated with the church, meaning that the congregation was most likely boosted somewhat by the parents of the girls in the uniformed organisations. Not including the Girl Guides etc, the congregation numbered roughly fifty, about (or just under) half of which seemed to be in their sixties or older. There were considerably more women than men in the congregation, although not so many as to make it completely disproportionate, and there were also four or five people of an ethnic minority. Being Remembrance Sunday, the theme of the service was praying for peace and remembering those who have died in war. After the Rainbows, Brownies and Guides entered the church with the flags of their groups (which were placed at the front), the service began with a prayer and responses lamenting the devastation caused by war. This was followed by a hymn and more prayers, after which the minister gave the girls in the uniformed organisations the task of cutting out paper doves, which would be used later. There followed the Bible readings, Michah 4:1-8 and Luke 6:20-31, focusing on peace and non-violence. After a second hymn, and a talk on the futility of holding Remembrance Day if we do nothing to promote peace, the congregation held the customary two minutes of silence at 11 am to commemorate all those killed in war. After the two minutes of silence – ended with the words “we will remember them” by the minister and repeated by the congregation – the paper doves were handed out as symbols of peace, with members of the congregation invited to write on them a peace-focused phrase from one of the Bible readings. After another hymn and prayers of intercession came the offering, followed by the final hymn. The service ended with a prayer. Tea, coffee, fruit squash and biscuits were served in the church hall after the service, but most members of the congregation seemed to stay in the church and talk rather than go into the church hall.